The holidays are filled with chocolate, cream cheese and butter. I know I am guilty you can see my previous posts for a lot of guitly pleasures this time of year. So I was excited to partner with Way Better Snacks on a recipe creation project for their 12 Days of Holiday Snacking. 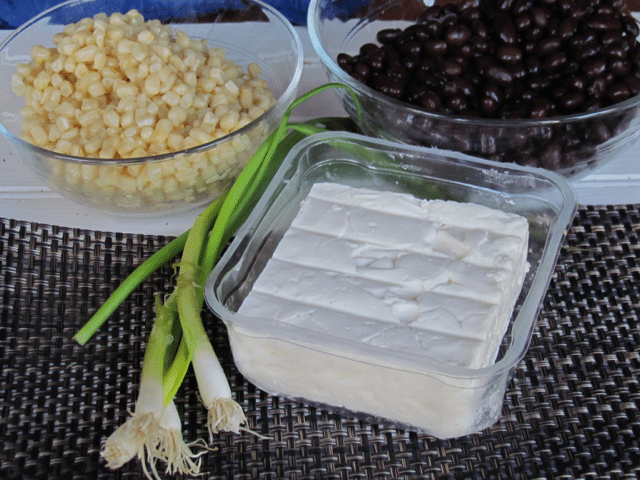 I created a healthy Holiday dip of Black Bean, Corn and Feta Cheese which is so good and was given to me by a friend several years ago but I have never made it. This is the perfect sweet but salty dip to accompany all the fatty appetizers and sweets on your holiday table. Make a double batch as this will go fast plus gets better the longer it sits in the fridge. I should have doubled the recipe for my event because I am craving it the day after and it disappeared in 30 minutes, no kidding. The ingredients are simple and you might have some of them on hand. If you don’t be sure to keep them on hand for the holidays for an easy and healthy Holiday snacks options. 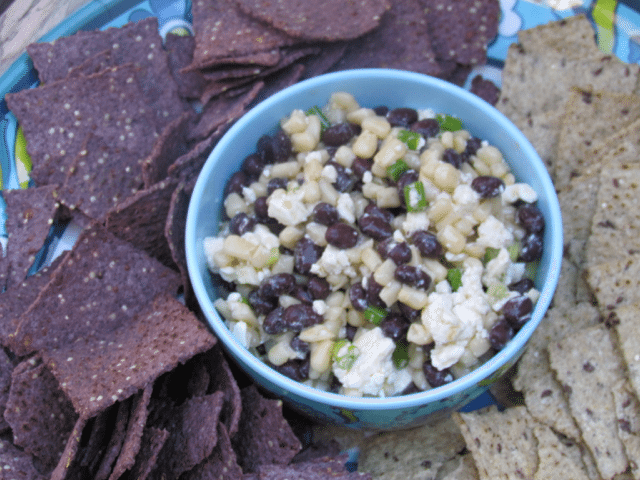 You will need a can of black beans, a can of white shoepeg corn, feta cheese, cider vinegar, sugar, and green onions. Just plop them all in a bowl, stir gently. Cover and allow the flavors to meld in the fridge at least a few hours. 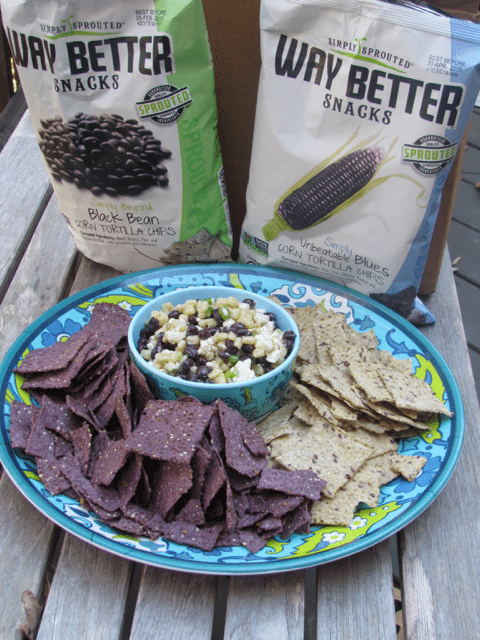 Don’t just serve any chips, consider pairing the black bean, corn and feta dip with Way Better Snacks. These healthy snacks incorporate sprouted ingredients like flaxseed, chia seeds, quinoa, black beans, broccoli seeds and daikon radish seeds. So there is an added benefit for snacking this holiday season. 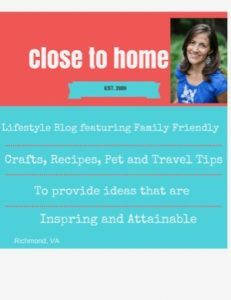 Be sure to check out all the other wonderful blogger recipes sharing their recipes with Way Better Snacks and their 12 days of Snacking campaign. It is making me hungry just looking at it. 1. Whisk vinegar, sugar, and olive oil together in a bowl. 2. 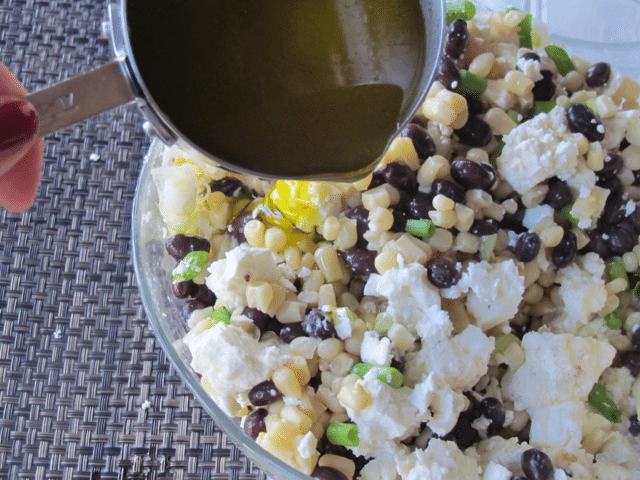 Mix black beans, corn, feta cheese, and green onions together in a separate bowl. Drizzle dressing over black bean mixture; toss to coat. Refrigerate dip for at least 1 hour before serving. Best overnight! This dip looks great! 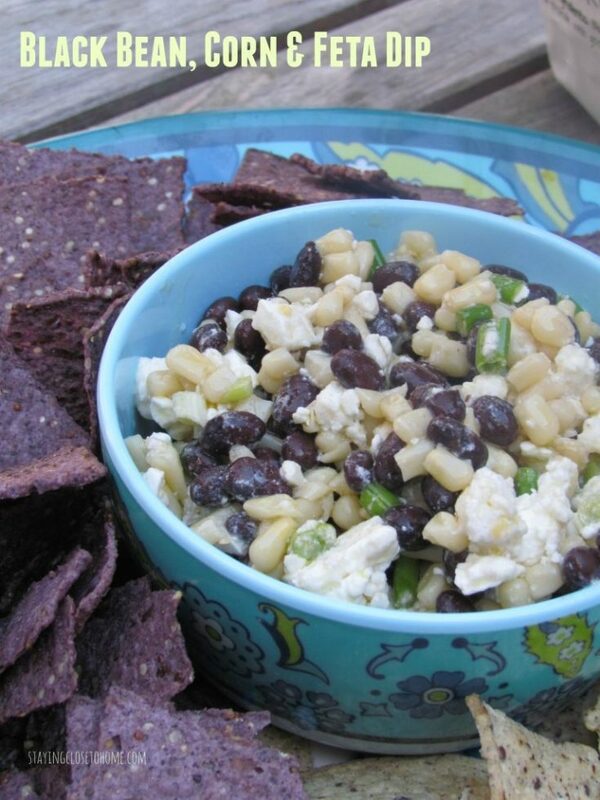 I love black beans and feta so I will definitely be trying this soon. This is an interesting combo. However, it sounds like it would be great for parties. My mom makes something similar and I LOVE it! I’ll have to tell her about the feta! 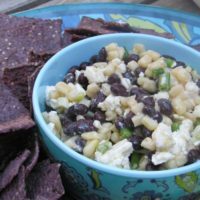 I like the idea of feta with the corn and black beans I have never mixed those ingredients and would like to try it out. Oh yum – will have to try your recipe. I love feta (really anything with cheese). Oh this does look really great! I live fresh and healthy. Now you’re talking! I’m all cookied out. Bring on the savory snacks! That looks so delicious and is way healthier than the snacks I usually have! That looks so delish. I am going to try this next week. Yummy. My family loves blue tortilla chips and the photos of your bean and corn dip have made me hungry. I have seen this recipe before but didn’t pin it – you can bet I’m pinning this time. This looks delicious! Thanks for sharing! that dip looks really yummy. Plus wow healthy chips to snack on I’m all for that. I wish I could reach thru the screen and grab a chip and have a taste! I would have never thought of using feta. You had me at feta. This sounds seriously amazing.